First sentence: Umm Hassan is dead. It is not too often in the Western world that you come across an epic tale about the Palestinian experience. Gate of the Sun, by Lebanese author Elias Khoury, is such a book. The story largely takes place in the Shatila refugee camp in Beirut. Khalil, a "temporary doctor, in a temporary hospital, in a temporary country", keeps vigil by the bedside of Yunes, an elderly Palestinian freedom fighter who lies in a coma. In an effort to keep Yunes in this world, Kahlil begins retelling stories of their life of exile in Lebanon, and particularly Yunes' secret visits to his wife, who remained in Israel. Yunes was a member of the fedayeen, the early Palestinian resistance movement, and much of the story recounts the flight of Palestinians during the late 1940's. However, the heart of the story is not political; it is the story of Yunes' love for his wife Nahilah, and his dangerous border crossings to visit her. It is a story of the mythical, magical world they created in his refuge, the cave Bab al-Shams (Gate of the Sun). 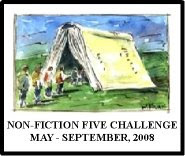 The novel was first published in Arabic in 1998, on the 50th anniversary of The War of Independence, referred to by Palestinians as Al Nakbah (the catastrophe). Mirroring the Arab-Israeli conflict, the story continuously digresses, is retold, and circles back on itself in dizzying fragments. A book about Palestinians, one would assume is also a book about Israelis. However, most of the history portrayed throughout the story traces the meshed history of Lebanon, Palestine, and the way in which Palestinian refugees outside of Israel are treated and viewed by other Arabs. Fortunately, this is not a novel of "us" versus "them", and Khoury humanizes all sides of the struggle that continues to encompass the Middle East. For those who are regular visitors to my blog, you will notice that my end review is considerably more favorable than my other recent comments on this book. It is a slow, dizzying read. It helps to have a firm knowledge of the Arab-Israeli conflict, and of the Lebanese civil war. Part One of the novel did not capture my attention in the way that the second Part did. In the end, though, I come away highly recommending this novel. 'How did you know?' asked Umm Hassan. 1. Some relationships are meant to last forever. 2. Wipsnade Zoo is the last concert I saw; it was part of the Rock for Refugees fundraising concert for the organization I worked for in Australia. 3. Spring should be a time to get out and explore nature during one of her finest moments! 4. Oh no! I forgot my wallet at the pet store yesterday! Fortunately, I went back 15 minutes later and retrieved it. 5. I've recently started a new book, Gate of the Sun by Elias Khoury. Oh wait, I've been working on that one for two weeks. 6. Maya's laughter and my husband's crazy antics never fails to make me smile. 7. And as for the weekend, tonight I'm looking forward to spending time with my family, tomorrow my plans include going to York to visit my mother and Sunday, I want to read! A book cover doesn't affect what I think of a book, but there is something special about holding a book with a beautiful cover design. If there is more than one edition of a book I would like to buy, I tend to lean towards the one with the best cover (unless I am after a specific translation, or publisher). I prefer softcovers, but not mass markets. Softcovers are easier to tote around, and to hold while nursing Maya (although I preferred paperback before she was born, as well). Illustrations inside a book are always a wonderful bonus, I wish more "adult" books had them. Font makes no difference - unless it is very tiny. I have 20/20 vision, but often, if I am reading a book with very small type, I tend to get easily distracted. Not sure why that is, but it is. I am almost, finally, done Gate of the Sun by Elias Khoury, so keep an eye out for a review in the next couple days. It is redeeming itself, so the long reading time isn't necessarily a sign of displeasure. We don't celebrate Easter, so today was a mainly a day to catch up on chores. Hubby accepted a job offer this week, so we will be moving to New Jersey in June, and hopefully buying our first house! With all of this excitement, I looked around and realized we have a LOT of work to do in the next few months. Which means that I don't have as much reading time at the moment as I would like. Unless you count the RightStart catalog I browsed through over breakfast! I am slowly making my way through Gate of the Sun, by Elias Khoury, but the verdict is still out on how I feel about it. Khalil is a doctor-yet-not-a-doctor who sits by the bedside telling stories to his mentor, an aging Palestinian freedom fighter who lies in a coma. The narrative jumps wildly around, which is what I am having a hard time getting used to (although I usually love the stream-of-consciousness technique) Khalil's stories are retold, reinvented, and reimagined as the story progresses. Can you love the writing and not like the book? I am very confused by all of the characters and events. Every time we revisit something that has happened in the past, it is told differently, and after a while all the different vignettes start to blur together. I am certainly humbled, and a little bit embarrassed. Here I am with a master's degree in International Relations, and I am quickly learning I don't know nearly as much about mid-east politics and history as I thought I did. At the very least, Khoury's book has spurred me to delve a bit further into this conflict, particularly how the Palestinian refugee influx impacted the Lebanese civil war, and Israel's involvement. Mix together sugar, oil, and eggs. Add orange juice, flour, & baking powder and mix until it forms a ball. If it is too moist you may need to add some more flour. Roll out until flat, and then cut into circles 3 inches in diameter (I used the top of a glass.) Place 1 tsp of filling in the center of the circle, and then pinch the sides to make a triangle. Bake on a lightly greased baking sheet at 350F for about 15 minutes, until lightly browned. 1. Starting to look to buy our first home is so exciting! 2. Strawberry fields are ripe for picking. 3. 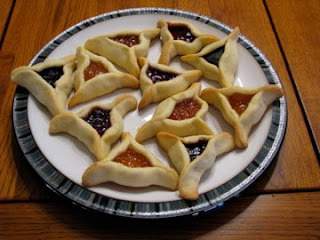 My hamantaschen recipe sounds like it would taste delicious! And it does! 4. Why does getting a haircut make me feel so good?! 5. Tibet is something I've always wanted to see. 6. It's sad when I think of the good friends we will be leaving in Baltimore when we move to New Jersey in June. 7. And as for the weekend, tonight I'm looking forward to relaxing, tomorrow my plans include going to a Purim carnival and Sunday, I want to discuss Animal, Vegetable, Miracle by Barbara Kingsolver at my local book group! You’ve just reached the end of a book . . . what do you do now? Savor and muse over the book? Dive right into the next one? Go take the dog for a walk, the kids to the park, before even thinking about the next book you’re going to read? What? It really depends on the book, my mood, and what is going on in my life. BM (Before Maya), I would often close a book, sigh, and pick up another one right away. Unless it was at night, or I had something else to do. Sometimes I would reflect on what I just read before picking up something else, especially if it was an intense read. AM (After Maya), I tend to appreciate the fact that I finished a book before grabbing another one! No matter what, I usually like to write my review before I get too far into my next read. At one point towards the end of Animal, Vegetable, Miracle, Barbara Kingsolver claims that her year-long journey as a locavore family (eating only local foods) was not purist. They had a hard time finding a local flour mill, and continued to use a few products, such as olive oil, spices and coffee, from other parts of the world. She came pretty darn close, however. This book is a chronicle of her family's journey during that year. Eating local foods for a year is not a project that Ms. Kingsolver jumped into ill-prepared. Her family owns some land in Virginia, and she has been gardening for many years. She had already engaged in some trial runs of raising turkeys, and was an old hand at raising chickens and growing a vast amount of vegetables. Therefore, her journey was not one of extreme difficulty. Which, I believe, is part of the point. Of course, it is not easy growing your own food organically. But, for someone in her position (ie urbanites may find it more difficult), it was not an impossibility. What she did not grow, she supplemented with food bought at the local farmer's market. And this is part of her point. If you commit to making an effort to buy some of your food locally, you will find that once you change some habits, it's really not so hard to do. And it tastes so much better. She makes the case that not only does store-bought conventional fruits and vegetables destroy our environment by stripping the land of nutrients, killing off wildlife with pesticides and insecticides, and pollute the earth with the fuel that is needed to transport out of season produce to your local store, but organic, local foods just taste better. I happen to wholeheartedly agree. Over the past few years, I have slowly discovered the gastronomic delights of local, organic produce. It started slowly. First, it was strawberries, the sweetness of locally picked berries just can not compare to anything else. Next, it was eggs. The first time I cracked open an organic, free-range egg, I couldn't believe how yellow the yolk was. And, it tasted so good (cooked, of course!). I then quickly moved on to milk from a local dairy (in a glass bottle), and all other sorts of produce. Since reading her book, I finally took the initiative to find a local free-range meat source that does not use growth hormones, and made the commitment to only buy meat from this source. There were quite a few parts of the book that covered topics I am already somewhat knowledgeable about, although it was a welcome refresher course. What I loved reading about was the descriptions of the food her family grew, and eventually ate. I loved her descriptions of what they chose to grow: Moon & Stars watermelon, Cajun jewel okra, Gold of Bacau pole beans, Georgian Crystal garlic, Speckled Trout Romaine....aren't the names of heirloom vegetables divine? I also learned what an heirloom vegetable was. The family stories of preparing their food together, and large gatherings over a slow meal made me jealous. My family just doesn't appreciate food that way, and a long, drawn out meal is almost impossible. Believe me, I've tried. Coinciding with Ms. Kingsolver's narrative are blurbs by her husband and essays by her eldest daughter showing a teenage perspective. Also included are recipes for each month of the year, utilizing food that is in season. I tried out one of the recipes while reading the book, for spinach lasagna (I can get local spinach and other lettuces year-round from a farmer that grows it in a greenhouse), and it was delicious. You can find all of her recipes at the book's website. Since this weekend is crazily busy, my Sunday Salon is more of a list format rather than anything intellectual. I am slowly catching up on reading the posts by people in my blogroll. Since I don't have the time to comment very much, this Salon is also a focus on the posts that have caught my bookish eye. 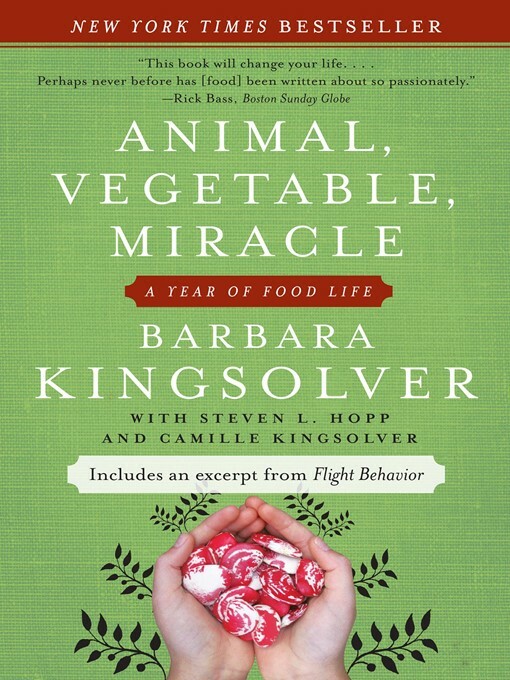 Just finished: Animal, Vegetable, Miracle: A Year of Food Life by Barbara Kingsolver. Up Next: I'm not sure! Most likely a non-fiction parenting book, either Positive Discipline by Jane Nelsen or The No-Cry Sleep Solution by Elizabeth Pantley and William Sears. Mrs Woolf and the Servants by Alison Light, and Fortune Cookie Chronicles by Jennifer Lee, mentioned by Danielle at A Work and Progress. Found here and here. Joy is graciously hosting this challenge again this year. Since I am on a fairly good non-fiction kick this year (finally! ), joining this one was a no-brainer. Last year had a few pregnancy books on my list. Following that, I'm sure I'll be reading a few parenting books between May and September. Okay, so our weekend trip to Providence turned into a full-week trip! My hubby had two more interview offers, one in New Jersey and another in Springfield, MA, so we just got a back from an impromptu vacation in New England and New York! We have discovered that Maya travels wonderfully-taking after her parents- and we were able to stay with my brother-in-law right outside NYC, so we never had to drive more than 4 hours at a time. We had a wonderful time, although everyone is a little bit tired, and the amount of housework I now have to do is bigger than my Mt. TBR! I have a few books waiting to be reviewed, but I'll have to put most of them off until I catch up on things. First sentence: Hercule Poirot came out of the Vielle Grand'mere restaurant into Soho. Interesting tidbit: The book was published on my birthday, March 3. Rather, I should say I was born on the day this book was published, since the book has been around much longer than I have! It's been a while since I have read a Hercule Poirot mystery, so it was a welcome break from some of the more emotionally depressing books I have been reading lately. As always, Dame Agatha does not disappoint. 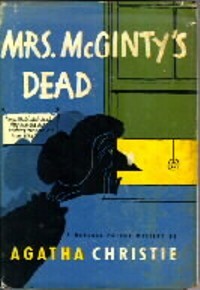 This story find Hercule Poirot venturing into a small England village to investigate the death of elderly Mrs. McGuinty. A man is on death row, having been convicted of her murder, however the local police Superintendent is not entirely sure he is guilty. The book is filled with quite a few eccentric characters; it is a very entertaining read. Christie's writes this one in a style similar to the Miss Marple books rather than the previous Poirot mysteries I have read. I have also finished reading Barbara Kingsolver's Animal, Vegetable, Miracle: A Year of Food Life, but I'm waiting to write my review until I have more time to sit down and think about what I want to say. Thank you everyone for the birthday and get-well wishes. I am feeling much better, although Maya now has a little bit of the snuffles. She seems to have a much milder version of my cold, hopefully helped by all of the antibodies she gets nursing. Her nose is only a little stuffy, and doesn't seem to bother her at all. With the money from my parents, I plan to buy this nice hemp bath pillow, and some bath bubbles from California Baby and Lush. I will be taking another mini-break over the weekend. Hubby has an interview at Rhode Island Hospital in Providence on Monday, so we decided to drive up there for the whole weekend. Keep your fingers crossed, this is our first choice out of all the applications he has submitted so far! And, if anyone knows of any neat things to see (bookish or not) or places to eat in Providence, or any local authors worth checking out, I'm open to suggestions! 1. Ahhhh, it's so nice to fit into all of my pre-pregnancy pants again. 2. One of my favorite things on my desk or bureau is our Mac. 3. Japanese Cherry Blossom will be in bloom soon, and we hope to make it down to DC this time to the festival! 4. The beach is my favorite place to sit and read. When, I'm not at the beach, the chair on my porch will do. 5. Pavlova and fresh fruit on top is delicious! 7. And as for the weekend, tonight I'm looking forward to um...packing, tomorrow my plans include reading in the car on the way to Rhode Island and Sunday, I want to explore Providence! I'll be taking a mini-break for the next few days. Along with some wonderful birthday gifts (of which I'll mention the bookish ones when I get back), I received one that's not-so-nice. Mother Nature gifted me with a nasty cold and sore throat, so I'm taking a small break till I'm back on my feet. Today I actually had quite a bit of reading time, and was able to get through a chunk of my current book, Animal, Vegetable, Miracle: A Year of Food Life, by Barbara Kingsolver. As I was reading Chapter Nine: Six Impossible Things Before Breakfast, this morning, I did notice a few gaps in her argument that I wish she would address. This chapter raises a very good point about our society, and how we moved away from healthy, fresh, homecooked meals. Barbara talks about the fact that she was raised in the era of women's lib, when the fight for women's equality in the workplace really got under way. Her generation did everything possible so they would not have to slave in the kitchen. Yet, at the end of the day, most women now have full-time jobs and still find themselves in charge of the housework. Innovative corporations saw this vulnerability of women entering the workforce, and stepped in by offering a solution: pre-packaged dinners and Lunchables. Barbara's argument is that mealtimes should be approached as a creative opportunity rather than a chore, which I wholeheartedly agree with. She also argues that almost everyone has the time to put together efficient, healthy, family meals. She then draws the comparison to working women in France who head straight to the market after work to find the freshest ingredients for that evening's dinner. This is where I start to have problems, because her analysis stops there. Don't get me wrong, I am a huge advocate for buying locally, eating fresh, homemade meals. But, I do not believe this movement will really take off unless certain aspects of our society change drastically. I feel that one of the largest hindrances for this to be successful in America is our work culture. In 2007, Americans worked an average of 46 hours/week. By comparison, our French counterparts only 39.1 hours/week. Here, we are lucky to get two weeks of vacation, while in my experience living in other countries, four-six weeks is often the norm. Although I have not seen any statistics, I would also be willing to bet that the average commute time in France is much, much shorter than many places in America. As a former member of the American workforce, I can attest to the difficulties we faced when both my husband and I worked full-time. For us, full-time was (and still is) 80 hours for my husband, and 50-60 for myself. On rare occasions, I was able to eat leftovers for lunch, more often than not it was a quick meal in the microwave in between appointments, or nothing at all. Many nights, neither of us were home for dinner, and once again dinner was on the fly. On the weekends and some evenings I made enough homemade meals to last for a few days, but not nearly enough for a whole week. I often had to work on Saturday mornings as well, losing my chance to go to the local farmer's market. So far in the book, this is my only complaint, that this problem is not acknowledged to a large extent, when I believe it is a huge hindrance to buying local, and weaning our country off of fast-food and packaged, processed meals. Of course, there are solutions. For our family, I chose to become a stay-at-home mom not only because I felt our two full-time schedules would not leave us with enough time to spend with our daughter; I also wanted her to be raised in a family that can enjoy slow meals where the food is fresh, the conversation long, and the wine sweet. :) Where she doesn't spend the vast majority of time with her parents while they are running around doing chores. We have sacrificed my income (75% which would have gone into child-care anyway, but that's another topic for debate!) and some luxuries to do this. Yet, we are still eating organically, paying our student loans, saving for retirement, and planning overseas vacations, all on a surgical resident's stipend. Of course, this does not work for everyone, and I do still have my occasional longings to work outside the home. What really needs to happen is for our society to take action to place the priority back on the family, rather than the job. In a rather large nutshell, these are all the thoughts swirling around my head as I read today.